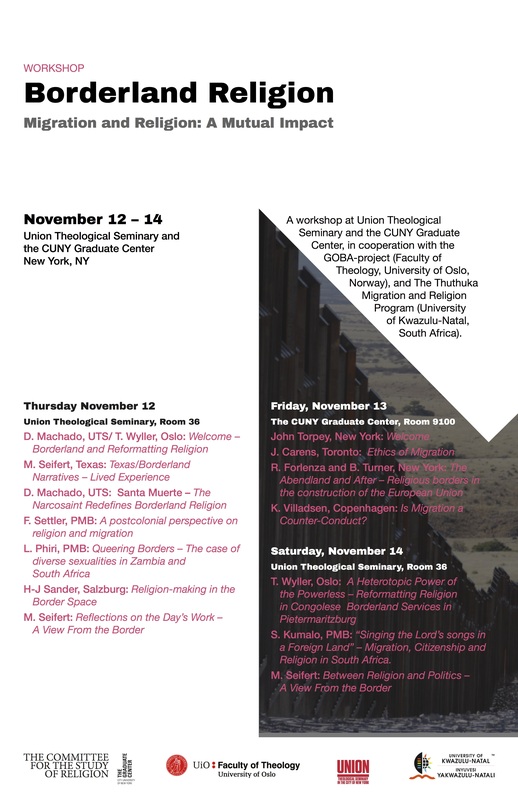 A 3 day workshop at Union Theological Seminary and CUNY Graduate Center in cooperation with the GOBA-project (Faculty of Theology, University of Oslo, Norway), and The Thuthuka Migration and Religion Program ( University of Kwazulu-Natal, South Africa). 4:00 – 5:00: K. Villadsen, Copenhagen: Is Migration a Counter-Conduct? 1115 – 1245: S. Kumalo, PMB: “Singing the Lords`songs in a Foreign Land”. Migration, Citizenship and Religion in South Africa. 1500 – 1630 General discussion introduced by B.Turner and F.Settler.